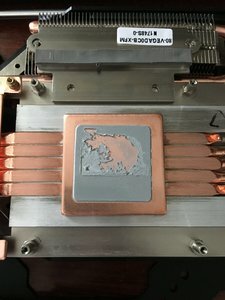 XFX Vega 56 dual fan - you should probably avoid this travesty. Discussion in 'AMD Flavor' started by LigTasm, Jan 31, 2018. What even is this? It makes a blower card sound like a pleasant whisper and the coil whine is out of this world. Probably best to avoid this one for gaming needs, it could probably mine just fine but its nearly unbearable in a rig anywhere near you due to the noise. I should have learned my lesson with the last few generations of XFX cards but apparently I didn't. 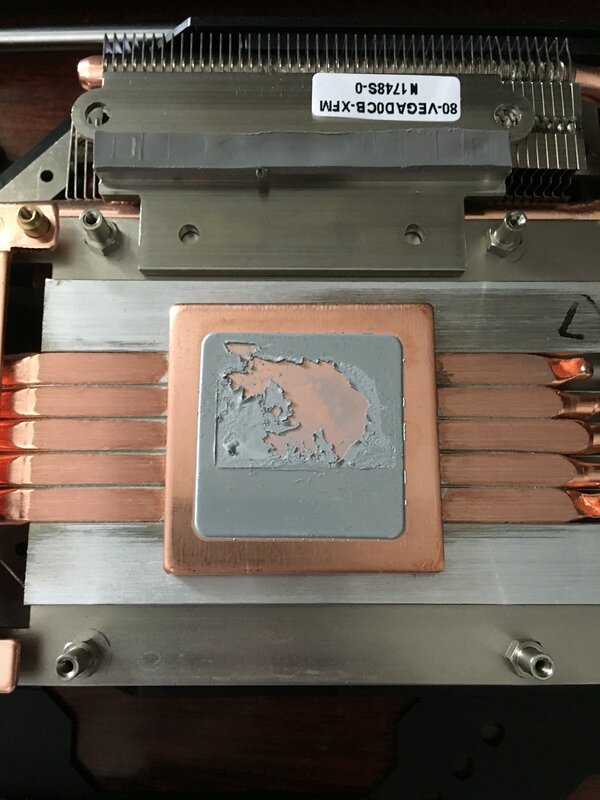 It has the same defect that many very early Vega cards came with - namely the concrete style TIM with zero contact on the HBM stacks because they aren't level with the GPU die. GSDragoon and JustReason like this. Pretty sloppy work. 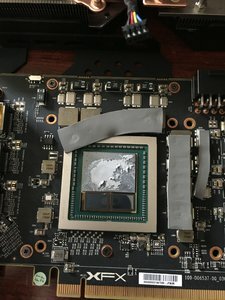 If I was going to push a Vega GPU, a do over seems in order on the TIM, Good info. Thanks. How's it perform after the new TIM? Is it still loud? Extremely. It makes me wish for the quietness of a 250W blower card, like maybe a 290X. I'll take a video of it tomorrow. The thing I can't understand is why its so loud, the temps are actually quite low. But the fans go all the way up after a few minutes no matter what. that is terrible considering XFX as of late are near to the top or the top of asking price they want to sell them at, figure they would, I dont know, make sure coil whine, poor quality of fans or at least ensuring they are properly calibrated would be among the top of their to do list, nah they just want to put an additional $50 or so more than others for dirt cheap plastic clip style for removable fan design LOL. I know plenty of buddies had far more Nv cards of various generations not last as long as competing Radeons, even when the fans did NOT fail, they just seemed to "up and stop functioning, maybe it was the raw amperage dump or extra high voltage??. I love blower style so card ventilates itself, but they seem to fail quicker and get crudded up with dust much more easily, not to mention they are generally quite a bit louder till ~86% load than most of the "custom" coolers end up being about the same loudness to my ears. Can you set a custom fan curve? I tried fiddling with the AMD software but it didn't seem to take. I will have to download afterburner or some other software and see what I can do. I'm not confident that it will stop as it seems to be "sensing" that it needs to be at full speed and you can't usually change that with a custom curve. That's disappointing to hear. I would say RMA it. But with the way things are with miners buying all the cards. It might take weeks before you get a replacement. I don't want to pile on XFX, but that card looks like a terrible design anyway. I would try Afterburner fan curve, it should help a little. I've had much better luck with OEM single fan units, pressing them hard doing Mining. The OEMs are louder but held up perfectly as compared to aftermarket dual fan designs - repeatedly having to RMA due to fan failure. Yeah, I don;t mine I just wanted something faster for 1440p gaming. This card is much faster than the RX 580 I had before but the noise is unbearable. Does your card use a reference pcb? I *might* be willing to be talked out of my stock 56 blower..It is a shame that VEGA is handicapped by these bad coolers and TIM jobs. These cards are super fast under water and I would Imagine with a decent air cooler they would be pretty good. I wouldn't own one without at least an AIO and a fan for a hybrid setup. Do you have Samsung or SK Hynix HBM? If Samsung, have you flashed a 64 bios to it? Get that HBM speed as high as you can, set the GPU to ~1750Mhz in Wattman with a GPU voltage of 1.05V and a PL of 50% and you should see better performance then you would at stock. If you aren't mining on your card when you are sleeping, you are missing out, especially if you bought it at the inflated prices of the last month or so. No its a "short" PCB. Its like the size of a Fury Nano. Its half the length of the total card, the back fan just hangs on empty space. I didn't realize this when I bought it or I would have been considering a water loop for it. To be honest XFX doesn't even have an official page for this model, I have no idea where the hell Best Buy dug it up. I found it on the japan XFX page. I don't know the HBM, but I know one of those fabs had the problem with the stacks being shorter. I'll check it if I can find the little utility for it. GPU-z will tell you if you have Samsung ram or not in the main spec page. All VEGA cards are short, are they not? I know my stock HSF/blower was like over a third longer then the PCB. Do you have dual BIOS? IF so there is no risk in flashing a 64 bios to it. 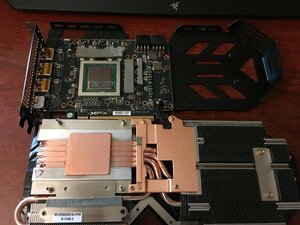 I would do the WC AIO bios so you have headroom if you add a hybrid cooler in the future. 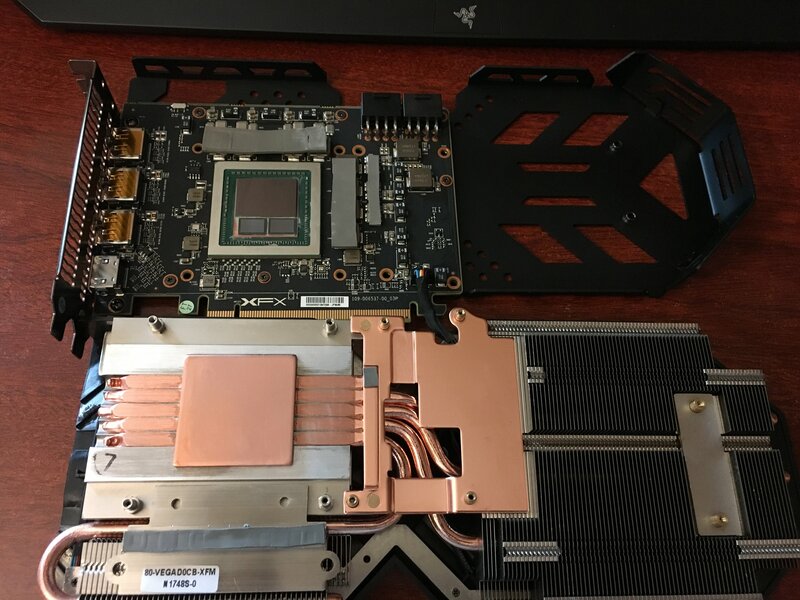 The cool thing about VEGA is that you can cool the GPU and RAM with the CLC since they are so close together, and then just use some heatsinks and fan for the VRMS. Getting that Vcore down will cool those puppies down a good bit. 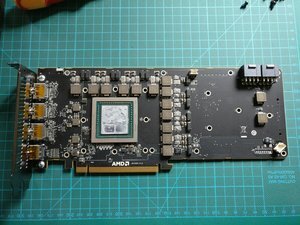 Reference Vega cards are full length (with a lot of wasted space on the back end), as are most of the custom PCB's. The short cards appear to be what was intended as "Vega Nano" but now are maybe just going to anything since they can't keep stock of them anyhow. My card has Hynix HBM, I'll see about flashing it but I'd rather try and get it working as-is and if not just return it to best buy. 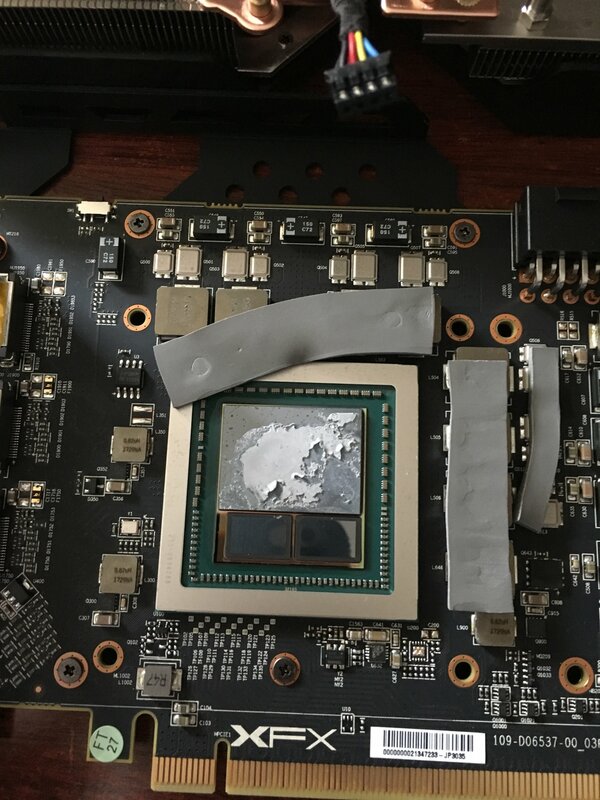 Update - I pasted it a 3rd time, this time I manually spread it on the GPU die and then put two big blobs, one for each HBM stack to fill in the gap and the temps seemed to drop a little more. Not the fans are not ramping to 95% but still to around 70% after only 45 seconds of playing a game. The coil whine is still the worst I've ever heard in 20 years of doing this, and it is worse at low frame rates. If an average user would have bought this card I guarantee it would have been returned by now, especially because of that "warranty void" sticker. Thin spread really isn't useful on a GPU like it is on a CPU, and impossible on the HBM with the stacks .010 below the die since it won't touch. Here is temps after 30 minutes of Valley looping, seems pretty normal for a GPU of this wattage. Looks ok core temp wise. I'm not sure what temp HBM should be at though. Blower Vega cards seem to be around 85C on the HBM, I think 80C is OK considering the very poor contact I have. Currently working on undervolting it, seems perfectly happy at stock 1570mhz clocks with 1000mv on the core. Do we still have an XFX rep floating around here? Yeah, it's XFXSupport , usually really responsive. That's an odd cooler design. I think they had some 580s that way as well; I remember looking at them and thinking I'd prefer one of the GTR cards with its more traditional appearance instead. After a few weeks of messing with this thing, I got it pasted well enough that it runs good and I finally got the fans sorted out by doing a fresh install of Windows and then the drivers again. Something got buggered up after I switched from the RX580 originally. The HBM does not overclock like a typical V56 does (even 850mhz is a no-go), this card is indeed identified by its vBIOS as a V56 Nano, and will not accept any V64 vBIOS to flash for higher clocks. But at least it works good now for "out of the box". Glad you it working properly! Old thread but, LigTasm, I would like to know how that card is working out for you at this point? Thanks. That thing is long gone, to be honest I have no recollection of what happened to it. Well, that answers my unasked question, run as far away from that as I could, do not buy. Thanks. I've had really good luck with the MSI Air boost blower cards, had 4 or 5 of them now and they've been fantastic, plus they fit AMD PCB specs so can be water cooled. Yeah to be honest the best bang for the buck card I've had this year is my Asus RX570 4GB. Got it on sale for $159 and its awesome, and it doesn't have the problem that Sapphire, XFX, and other brand RX 570/580 card have which is ridiculously noisy fans. I don't know what the AMD partner companies are doing but every card I've had from other brands is so damn loud its miserable. XFX is by far the worst, both fan designs they have are stupidly loud. Heat sink is rated for 360 watts...? Speaking of Vega, am I blind or does Steam Hardware Survey not list Vega 56 and 64 as option? Do that few people own them? Doesn't work on the Nano PCB, I have one of those coolers. The caps are too close to the package and it interferes with mounting. Well the card is looooong gone, I have an MSI Air Boost V56 blower card and an XFX V64 LE now. Both work leagues better than this thing did.